TWITTER HAS SUSPENDED the personal account of far-right conspiracy theorist Alex Jones for a week. The social network took the decision after Jones published a video in which he was deemed to have incited violence. Jones will be unable to tweet or retweet from his personal account for seven days, though he will be able to browse Twitter. However, the Twitter account for his Infowars show has not been hit by the suspension. Among the conspiracy theories Jones has peddled are charges that the US government was behind numerous terrorist attacks, including the 11 September 2001 strikes on the World Trade Center and the Pentagon. His suspension comes a week after Twitter’s CEO Jack Dorsey defended a decision to allow Jones to continue to use the platform, arguing that he hadn’t broken user rules. 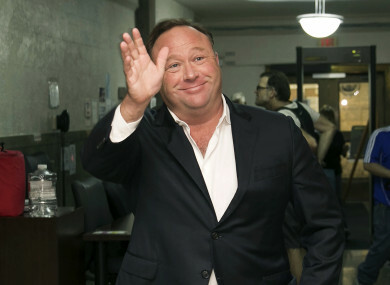 Apple, Facebook, Spotify and YouTube had all previously banned Jones on the grounds that he engages in hate speech. In March, Dorsey promised to improve the standard of conversations on Twitter, after the network became dogged by claims that it was filled with bots and troll accounts. Up to 70 million accounts were subsequently removed from the network in May and June. Email “Twitter suspends personal account of Infowars' host Alex Jones”. Feedback on “Twitter suspends personal account of Infowars' host Alex Jones”.